When you look for an escape from the city chaos and need some pampering too the closest haven from Delhi is Tree of Life Resort and Spa. Cloaked in serenity the resort is synonymous with luxury and comfort. Built in red sandstone, the traditional Rajasthani style architecture of the place is a complete contrast to its modern amenities. Chirping birds in the lush gardens and lovely water bodies are soothing to the city denizens. The villas are spacious and well equipped. Garden villas are great for winters whereas pool villas are perfect for the spring or summer months. The spa provides all kinds of massages only on prior bookings. Best months to go are from October to March through September and April too are not bad if you take a pool villa. 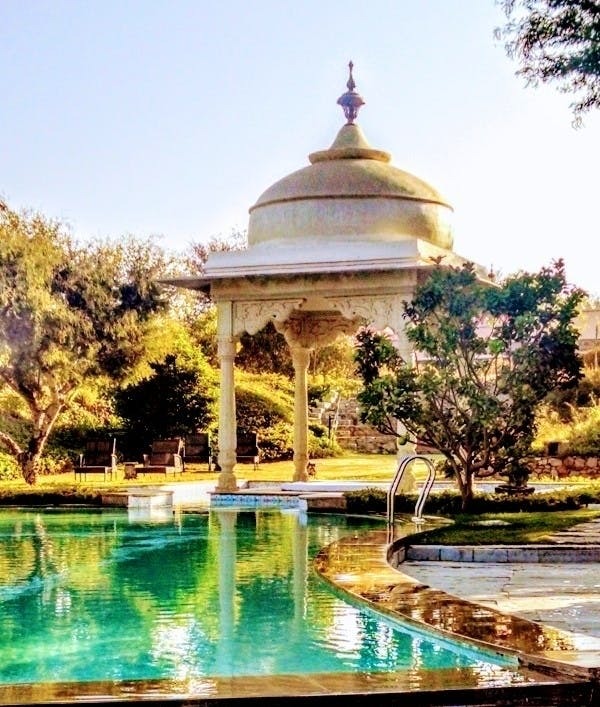 Jaipur city is an hour away from the resort so for a shopping trip to the city one needs to plan in advance though one would completely surrender to the serenity of the place and prefer giving a miss to the city trip and instead chill at the resort with their family. Nestled in the lap of Aravalis, Tree of Life Resort and Spa is situated at a distance of 257 km from Delhi that can be reached by rail, road or air. By road one can start early to cover the 5-hour journey and reach before lunchtime. There are several trains and flights that take you to Jaipur railways station/airport, from where one can reach the resort in Kukas by a cab within an hour's time. Don't forget to peep outside the plane window before the touch down to take a top view of the resort, all pink domes in the green carpet of grass.